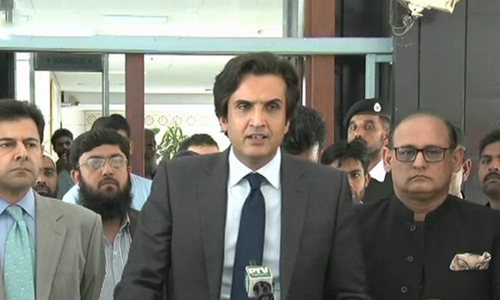 LAHORE: Pakistan has decided to widen the scope of the China-Pakistan Economic Corridor (CPEC), says Minister for Planning, Development and Reforms Khusro Bakhtiar. 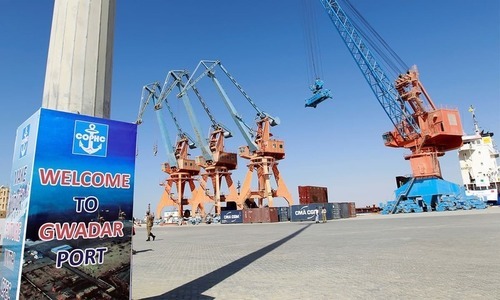 Unveiling the CPEC’s new vision during a news conference here on Sunday, he said Pakistan and China had signed agreements for industrial, agriculture and socio-economic development projects under the CPEC. Mr Bakhtiar said Pakistan would reinforce its economic growth and if everything went as per plans the country would jump from the low-income countries’ group to the middle-income countries’ group in the next three to five years. He said the CPEC’s Joint Cooperation Committee (JCC) meeting in Beijing had agreed to expand the corridor project with industrial, agriculture and socio-economic developments, besides promoting the petrochemical chain, hydrocarbon sector, as well as maritime sector to tap potential. He said that since China had $4,000 ­billion global trade, including $2,200 ­billion exports, Islamabad had urged Beijing to generate push factor by bringing its light engineering and manufacturing industry to Pakistan. “Pakistan will generate pull factor to expand manufacturing base that is shrinking for the past many years,” he added. Lamenting that Pakistan’s exports were just around $25 billion, the planning minister asserted that his government would bring Pakistan out of the quagmire of ­economic challenges. He said the industrial cooperation with China would help relocate industry and operationalisation of four special economic zones (SEZs) in Rashakai, Dhabeji, Faisalabad and Islamabad. 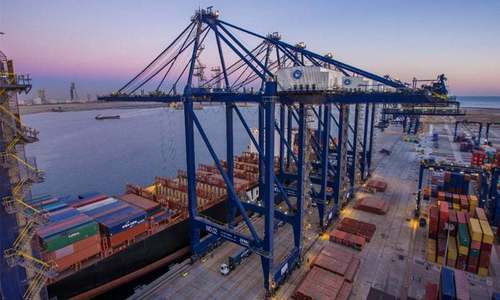 He said that these four SEZs could help increase Pakistan’s exports by $6.5 billion and reduce imports by $3 billion while manufacturing the required items. “Pakistan’s trade deficit can be reduced by $9.5 billion in a matter of three years,” he said. Asserting that Pakistan’s major challenge was to increase exports, he claimed that Pakistan imported less this year and its trade deficit decreased by 19 per cent. Stating that agriculture constituted Pakistan’s 25pc of GDP, Mr Bakhtiar regretted the previous Pakistan Muslim League-Nawaz (PML-N) government did not make agriculture a focus point in the the CPEC project. “The PTI government has signed Agriculture Framework agreement some five years after the launch of corridor project in 2013 and its first joint working group meeting has been scheduled for next month,” he said. Explaining ground realities, Mr Bakhtiar said China was importing beef, mutton and chicken to the tune of $7 billion, but Pakistan showed zero exports. Similarly, China is also importing fisheries products, with a minimal share from Pakistan. “In agriculture, livestock and fisheries sectors, we can gain benefit in short-term,” he said. The planning minister said that China had agreed to give a grant of $1 billion for development of education, health, irrigation and less-developed areas. He said Prime Minister Imran Khan was focusing on poverty alleviation and in this regard the government had planned six pilot projects. The Chinese model will be adopted for poverty alleviation in the country. “The prime minister has also constituted a Poverty Alleviation Coordina­tion Council to launch interventions and meet people’s basic needs,” he added. He said Pakistan wanted to upgrade railways (ML-1) from Peshawar to Karachi, expedite work on western corridor and Quetta-Zhob connectivity. “Pakistan plans projects on a build-operate-transfer basis so that they become self-sustainable and viable,” he added. In the power sector, he said the government would be focusing more on generating cheap electricity than going after expensive solutions. In order to propel the pace of development and growth, he said the JCC had been proposed to meet twice, while working groups meet thrice a year. In order to remove secrecy regime, he said, the prime minister had finalised the constitution of a Business Advisory Council. He said the south Punjab secretariat, having complete administrative and financial autonomy, would begin working before June 30. Asserting that the south Punjab province would be created on administrative grounds, he said the incumbent government would need support from the opposition parties to bring amendments to the Constitution. CPEC had one main motive - to increase Chinese exports. We have been waiting for decades to leave the low income group. I am not quite so optimistic. China posts slowest growth in 28-year in Q4, 2018. After PMLN its PTI's turn to fool us in the name of CPEC. Just blame previous government and claim the moon and don’t have anything to show. Scope "widened" actually tells us that the scope is diluted. Yes,why not?? Let's rename Pakistan as CPEC!! I think pakistan has readched a stage wherein it is fully dependent on China for even day to day living. Nobody should comment on such absurdity. Sure it will with loans in our heads.. If Pakistan allows China to control its industrial and agreecultural sectors, what else is left in the control of Pakistan. Once China has economic stranglehold on Pakistan , it’s is not any more a sovereign country. Pakistan dependance on a single country makes its vulnerable and it could very well lead to its own demise. Excellent planning. Need competent managers and administrators to implement such plans. Hope practical steps are taken, resources are allocated and dedicated teams are assigned to achieve those stated objectives. Make Pakistan an economic power, more industries, more production, more jobs for people, more products made locally, less imports and more exports. Pakistan Zindabad.
" The country would jump from the low-income countries’ group to the middle-income countries’ group in the next three to five years." He is building castles in the air. Like any other country Pak is also trying to strike a balance in its relationship with US and China.The issue is politicians are corrupt and diplomatic institutions are not strong enough to bargen a pro Pak deal either with US or with China. Both giants easily use Pak in their own way causing multidimensional issues in areas of Economy and Security of Pak. Very strange act by govt. When whole Pakistan want to reveal the CPEC terms against Pak and people are aware about Hambantotta, Maldives debt etc how PTI feels any announcement regarding expansion is in their ffavour ? Don't they bother about the votes of people of Pak?? were they elected or selected? ?